Dragonwood is a dice and card based game designed by Darren Kisgen and published by GameWright Games. A “game of dice and daring” with a medieval fantasy theme, it is designed for two to four players age 8+, but any child who can read can play. With some minor rule shifting, Dragonwood was playable by our four-year-old. In Dragonwood, players are tasked with capturing the orange and blue dragons, and they can gain items and defeat creatures along the way to help them in their quest. Each player is dealt 5 cards to start the game. On a player’s turn, they can “Reload” (draw a card from the Adventurer Deck) or “Capture” (play cards to try to defeat one of a few face up cards on the table in an area called the “Landscape”). The Adventurer Deck is a collection of cards of five different colors with numbers ranging from 1 to 12. This is functionally very similar to a standard deck of cards. Players acquire these cards by “reloading” during their turn, drawing a single card from the face-down deck. When it is time to attempt to capture a card from the Landscape, players can play up to 6 cards from their hand. Each Landscape card has at least three numbers on it – numbers for “strike” strength, “stomp” strength, and “scream” strength. Item cards have a special ability the player can use if they get the card, and creature cards have a victory point value the player earns if they defeat the creature. One of my favorite parts of Dragonwood is how the Landscape cards are captured. Players can attempt to acquire a card from the Landscape by striking, stomping on, or screaming at the card in question. To “strike” at a card, the player must play a set of cards from their hand in sequential order – a straight. To “stomp” a card, the player must play a set of cards from their hand that are all the same number – up to six-of-a-kind. Finally, to “scream” at a card, the player must play a set of cards of the same color – a flush. They then roll dice – one for each card played, and add them together for a total score. Meeting or exceeding the target card’s strength captures the card. These card sets introduce a terrific poker-like element that is clearly and easily understandable for young children. Readers can explain the item cards that have text, or they can simply be removed to allow a non-reader to play if they are able to count. At the end of the game, when both dragons have been captured or the Adventure Deck has been run through twice, the winner is the player with the most victory points. Again, this is a great opportunity for rule-shifting with younger children. One option would be to merely count the captured creatures and award the win to the player with the most captured creatures. This can encourage children to grasp the idea of opportunity and seek to defeat the easiest creatures available. Dragonwood is a wonderfully simple game that is a joy to play and offers fantastic replayability. Unlike many classic “children’s games” that are purely luck based (and generally insufferable for parents to play over and over) Dragonwood offers the opportunity for simple strategy. The art is beautiful and the mechanics translate well into a narration (“I will stomp on the goblin!”). Dragonwood is a delight to play with children and adults alike. On top of the stellar gameplay, Dragonwood helps children practice pattern recognition, counting, probability, and strategy. 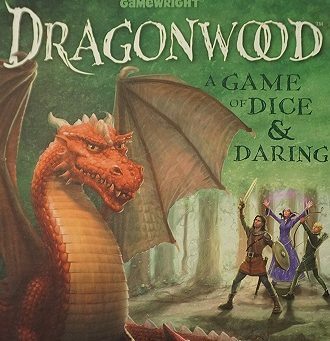 Priced between $10-$15, Dragonwood is an excellent addition to a young gamer’s growing library. You can purchase your own copy of Dragonwood at Amazon or your friendly local game store. The Family Gamers were provided a complimentary copy of Dragonwood for review.